Below are common attributes associated to Holy Basil. Become a care taker for Holy Basil! Below are member comments regarding how to plant Holy Basil. No comments have been posted regarding how to plant Holy Basil. Be the first! Do you know how to plant Holy Basil? Below are member comments regarding how to prune Holy Basil. No comments have been posted regarding how to prune Holy Basil. Be the first! Do you know how to prune Holy Basil? Below are member comments regarding how to fertilize Holy Basil. 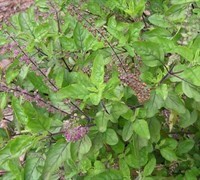 No comments have been posted regarding how to fertilize Holy Basil. Be the first! Do you know how to fertlize and water Holy Basil? Below are member comments regarding how to deal with Holy Basil's pests and problems. No comments have been posted regarding how to deal with Holy Basil's pests and problems. Be the first! Do you know how to deal with pests and problems with Holy Basil? Get Holy Basil fresh and large directly from the grower to your garden! Buy Holy Basil online from the nursery wholesalers and save BIG! Holy basil is very easy to grow. As with other basils it is a tender herb that cannot withstand frost and will only thrive with night temperatures above 54°F (12.2°C). This tender perennial is usually grown as an annual in garden beds outdoors but can be successfully grown indoors throughout the year. It can also be grown outdoors in containers which can be brought indoors when temperatures are forecast to drop below 55°F. I grow the plant in containers and use a professional potting MIX. During the warm season I set the container on my back deck where it receives at least 8 hours of direct sun a day and the plants do fine. Because I ingest Holy Basil for stress relief and other benefits, I fertilize the plants lightly with a mild, organic plant food in spring and again in early summer. I don't allow Holy Basil to go to flower. As soon as I see flower buds forming I cut them off. Throughout the season I harvest the leaves for use in a tea I make with them. The tea is very soothing and has helped me in reducing symptoms of stress and anxiety.